I’ve had ‘peacock’ on the wheel for a while. I love, love, love this colorway, but it is a commercial roving that is just tricky for me to spin. It seems like the fiber all line up, so I’m breaking it every five inches. Super gorgeous, though, with a hint of copper. It’s all plied now and waiting for a bath. I’m not sure what I’m going to knit it into yet. A cowl is what I’m leaning towards. Then there is this beauty. I joined Moon Rover’s fiber club and her dyed rovings are spectacular. I am going to do a single of the beautiful white alpaca blend The Gentleman got me for Christmas and ply it with a long colorway single of this beauty, and then a shawl for me. I made a Boneyard shawl from handspun a couple weeks ago, but it was really small so I hope that this 10 ounces spun up with be significantly more yardage. I’m sure it will be. 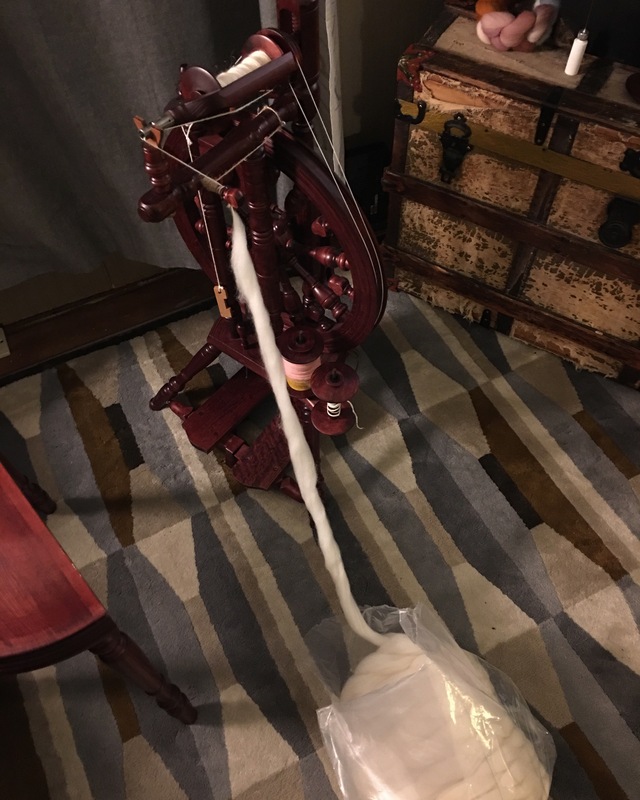 And, because the ‘kitten’ cat is a jerk and has been eating yarn and fiber (I kid you not), I am spinning this gorgeous roving out of the plastic bag it came in. I know! Terrible! But he literally started eating it while I was spinning it. 05 Mar	This entry was published on March 5, 2016 at 5:43 pm. It’s filed under Projects and tagged alpaca, spinning singles, spinning wheel, spinning yarn, yarn. Bookmark the permalink. Follow any comments here with the RSS feed for this post. Your peacock is beautiful. It looks and sounds as if it could have been combed top instead if roving. (some places use the term top or roving interchangeably, but the main difference is that top the fibers run parallel lengthwise and give you more of a worsted wool yarn instead of a woolen one! )…you did good with it. Thank you! I’ve found the more processed the fiber, the harder time I have spinning it. The colors are spectacular, though! I’m hoping to get brave enough to process a fleece this year – but maybe I’ll start with some unwashed locks. Have a great weekend!